TORONTO, Ont. 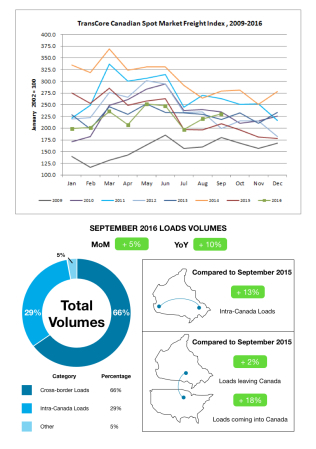 – Freight volumes for Canadian and cross-border loads closed higher for the third quarter of 2016, up 5% month-to-month and 10% compared to September 2015, according to TransCore Link Logistics. Compared to the third quarter of 2015, load volumes were down 8% in this year’s third quarter, but year-over-year volumes were higher by 7% when compared to the third quarter last year. Intra-Canada load volumes accounted for 29% of the total volumes, up 13% from the same time last year, while cross-border loads averaged 66% of the total data submitted by Canadian based customers. Loads leaving Canada were up 2% and loads entering Canada increased 18% year-over-year. TransCore also found a decrease in equipment capacity by 9% month-over-month, but up 3% year-over-year, with an equipment-to-load ratio decline to 3.10 trucks for every available load from 3.58 in August and 3.29 in September 2015.